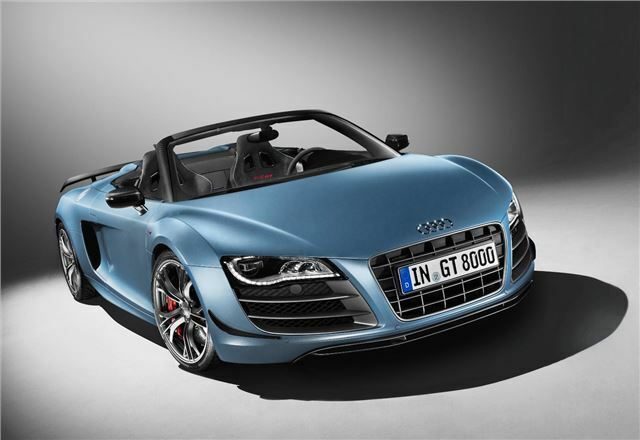 Audi is to build 333 examples of the limited edition 560PS R8 GT Spyder, of which 66 will come to the UK. The light weight 197mph supercar will be available to order later in the summer, with first deliveries in 2012. The R8 GT Spyder is powered by a 5.2-litre V10 which produces 540Nm of torque, and can get the car from 0-62mph in just 3.8 seconds. The R tronic sequential manual gearbox can change ratios in one tenth of a second, and can operate in three modes – Normal, Sport and Manual. An electrohydraulically operated fabric roof can be raised or lowered in 19 seconds, even when on the move at speeds of up to 31mph. Weight is 85kg lower than the regular R8 V10 Spyder, with weight reductions owed to aluminium body panels, a magnesium engine frame and the use of carbon fibre in some elements of the body. The transmission, wheels, and brakes are also lighter, as are components of the interior, with a saving of 31.5kg on the seats alone. The GT Spyder has a new front splitter, ‘flics’ on the bumper, round tailpipes, a larger diffuser, red badges and new LED tail lights to set it apart from the none-GT model. To help deliver 560PS to the road safely there’s a quattro all-wheel drive system, although to keep things entertaining the system is biased to deliver more power to the rear wheels than the front most of the time. The aluminium double wishbone suspension is 10mm lower on the GT Spyder. The interior is trimmed in black Alcantara as standard, with optional red or grey details. Leather is optional. White dials with GT logos, amongst other details, set this model apart from the rest of the range. DVD-based satellite navigation, a Bang & Olufsen audio system, Bluetooth, LED headlights and air conditioning are all standard.